Last summer, heavy rains fell on New Orleans and caused widespread street flooding. These floods prompted Mayor Mitch Landrieu to launch a $26 million plan to, among other resilience measures, assess and rehabilitate thousands of the city’s street-side catch basins. 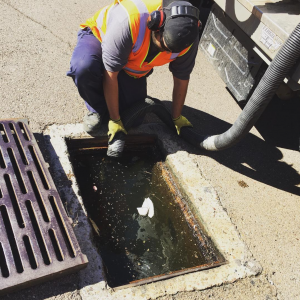 In the months that followed, work crews unblocked more than 15,000 clogged catch basins, recovering a mind-boggling 3.2 million kg (7.2 million lbs.) of debris. 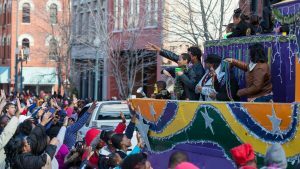 At a New Orleans Department of Public Works (DPW) news conference in January 2018, officials described one of the clean-up effort’s more notable findings: 42,000 kg (93,000 lb) of Mardi Gras beads, reports NOLA.com. Along with thousands of party-goers, New Orleans’ February 2018 Mardi Gras celebration attracted more than 200 additional guests: long, orange barriers that were deployed in front of storm drains along five blocks of St. Charles Avenue, a heavily frequented Mardi Gras parade route. The barrier, called a “gutter buddy,” is a sleeve made of a permeable fibrous material filled with small pebbles. The devices act as buffers that allow stormwater into drains, but keep beads out. Bead necklaces traditionally are thrown to revelers in the streets from overhead balconies during parades. The city paid about $30,000 to try the gutter buddies, which during this year’s Mardi Gras worked in tandem with about 600 city employees and temporary workers to ensure as few pieces of trash as possible ended up in New Orleans’ storm drains. Once the festivities had ended, DPW collected the gutter buddies from parade routes and began a survey of storm drains to measure how much debris slipped past the barriers. Galloway told WVUE Fox 8 News in February that preliminary results indicated “there was a lot less debris [in the storm drains] than we have seen in the past.” She also suggested that deploying the reusable gutter buddies will be a regular practice for the city during future Mardi Gras celebrations. The findings from last year’s storm drain clean-up also spurred a new effort by New Orleans community groups to dispose of beads responsibly. In a pilot program held this year, local non-profit groups Arc of Greater New Orleans (ArcGNO; Metairie, La.) and the Young Leadership Council (YLC; New Orleans) made it easier for parade-goers to recycle unwanted beads, plastic cups, and other non-biodegradable party favors. The groups established six temporary recycling centers along parade routes and enlisted volunteers to pick up debris from streets and hand out recycling bags to onlookers. They also recruited recycling trucks from nationwide waste management company Republic Services (Phoenix) to follow parade floats, allowing guests to dispose of their recyclables immediately without making an extra stop at disposal areas. ArcGNO, which focuses on creating opportunities for people with disabilities, has collected, repackaged, and sold recycled Mardi Gras beads for over three decades, according to its website. This year’s recycling partnership with YLC supported that mission, creating wage-earning jobs for its clients while improving the environment and mitigating clean-up costs for the city.